The aorta, which is the largest artery in the body, originates from the left ventricle of the heart and extends to the abdomen, where it is divided into the right and left common iliac arteries. Each vessel passes down to their corresponding sides and traverses about 5 centimeters before turning into the internal and external iliac arteries. The organs as well as the gluteal muscles located in the pelvic area get their blood supply from a vast network of small arterial branches that branch out from the internal iliac artery. The pelvic wall gets its blood supply from the lateral sacral arteries as well as the iliolumbar artery. Within the pelvis are several visceral organs that get their blood supply from the middle rectal artery and other arteries that serve the bladder and the superior, middle and inferior vesicular arteries. The female reproductive organ gets its blood supply from the internal iliac arteries. Both the superior and the gluteal arteries provide the blood supply to the muscles that compose the buttocks, whereas the obturator supplies blood to the upper thigh. The external genitalia get its blood supply from the internal pudental artery, which branches off the internal iliac artery. The internal iliac artery is also primarily responsible for the excessive demand in blood supply of the external genitalia during sexual arousal. The internal iliac artery serves several muscles in the pelvic region, as it is also primarily responsible for the premium muscles. Just outside the pelvic cavity is the external iliac cavity that goes right through the tissue near the inguinal ligament and the femoral artery. Prior to the inguinal ligament are the two additional branches of the external iliac artery. The epigastric artery is the one responsible for carrying blood supply to the muscles that line up the walls of the abdomen. The other part supplies the muscles within the iliac fossa. Just along the upper half of the thigh are the femoral muscles. These muscles travel across the femoral triangle and within this area, the femoral artery passes along the surface of the skin where the pulsations of the heart are felt. There are several other branches that extend from the femoral artery to keep up with the blood demands of the thigh muscles. The femoral artery provides the blood supply for the hamstring muscles and the muscles near the femur are supplied by the lateral and medial circumflex femoral arteries. The popliteal artery, via small offshoots, supplies the knee joint; this particular artery then divides into two new arteries: the posterior and the anterior tibal artery. 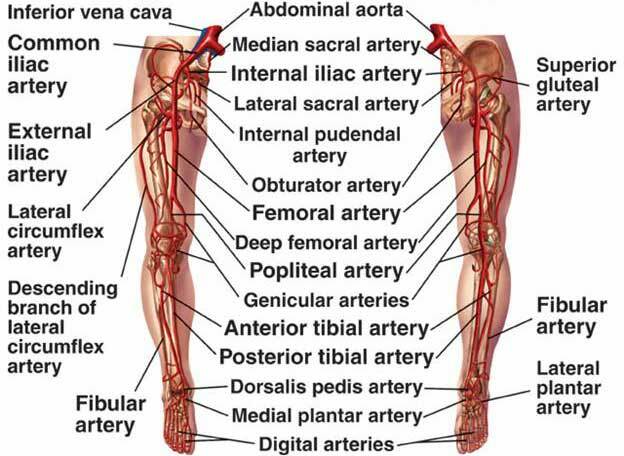 Each of these arteries supply blood to the region assigned to them; these regions include the muscles surrounding the tibia and the muscles that extend downwards through the foot. Once the artery reaches the ankle region, it converges and becomes the dorsal pedal artery, which is primarily responsible for supplying blood to the superior region of the foot and the ankle. The dorsal pedal artery is a very important artery where medical information is derived through testing to find out the pulsation of the heart. This is because the pulse can be taken from this area and since it comprises most of the distal region, a lot of information can be taken about the general condition of the circulation of the entire body just by testing this area.